Unfortunately, due to sales rights restrictions, we cannot offer Missionaries and Idols in Polynesia for sale in your country. The first Europeans to follow the explorers of the eighteenth century into the South Pacific were missionaries. They were sent by an Evangelical Christian organization called The London Missionary Society, whose aim was to bring the word of the Bible to all peoples - "to illume a dark and sinful world”. Their first target was Tahiti, an island of extravagant beauty, inhabited by a people of astonishing sophistication. The missionaries settled down, learned the language and stayed for decades. 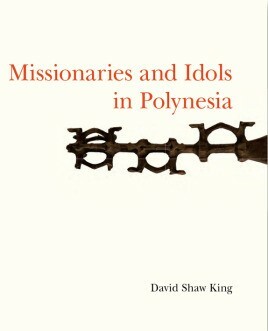 Although their aim was to Christianize the islanders and eradicate the traditional religion along with its pagan idols, they ended up recording a good deal about Polynesian culture and even saving a large number of the very idols they came 12,000 miles to destroy. Accompanying an exhibition at the University of London's Brunei Gallery, this beautifully illustrated catalogue documents the London Missionary Society from its formation to its initial ‘success' in Polynesia. The period covered spans roughly 1792 to 1825. Along with historical graphics and archive material - paintings, engravings, books, journals and correspondence of the missionaries - this publication shows some of the idols and artefacts that the missionaries brought back - feather gods and spirit images, necklaces, instruments and tools. In the words of missionary Rev. John Williams, it puts on view an historical "ocular demonstration” of The London Missionary Society. Most objects shown here have not been on public display since the nineteenth century. After the initial and very difficult spiritual conquest of Tahiti - the "night of toil” that took 15 years - the English missionaries turned the thorny job of Christianization over to Polynesian ‘teachers', who, in the words of Rev. John Williams, knew how to clear away "the rubbish of idolatry & superstition far better than newly arrived or even Old Missionaries”. The best teacher of all was Papeiha, who was energetic, purposeful and a native speaker of Tahitian. His account of events while Christianizing Rarotonga - published here for the first time - is probably the most personal, immediate and detailed description of a conversion in the South Sea. Missionaries are roundly criticized for their unrelenting determination to alter traditional Polynesian religion and customs. In what they referred to as the "bloodless victory”, they largely succeeded. Yet in many ways Evangelicals were progressive. They were vehemently opposed to slavery, infanticide, human sacrifice and warfare. They brought writing, taught literacy, and printed books; in doing so they fi xed the Polynesian languages. They urged the elevation of women in Polynesian society. Unlike the American missionaries in Hawai'i, for example, their aim was to establish spiritual rather than territorial or economic dominion. However questionable the missionary endeavour, the writings and collections presented here show that the missionaries were also agents of cultural preservation.